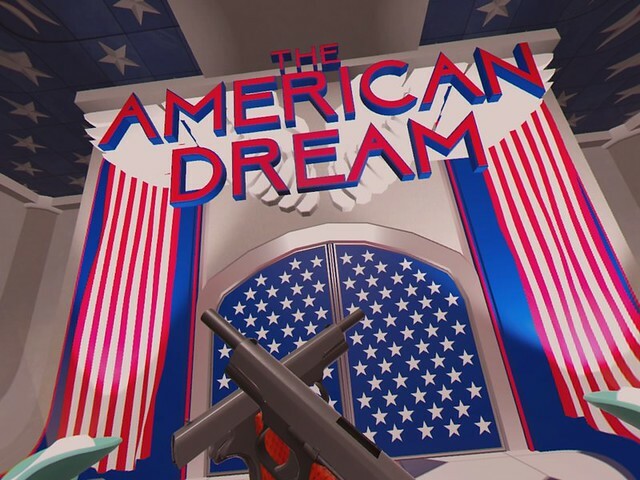 The American Dream is a beast rarer than a five-legged unicorn; a multiformat, high-profile-ish release that dives head-first into satire and refuses to surface. The target of the game’s humorous wrath? American gun culture and the NRA. This leaves the project vulnerable on several fronts. Purely because of the subject matter, a certain type of person will be immensely critical of the game without ever giving it a chance. Then there’s the potential to unintentionally prove insensitive to victims of gun crime. Above all else, arguably, is the simple fact that this must work as a satire and as a videogame. If one half fails, the entire project will crumble. First of all, it’s important to note that if you plan to play this on PSVR (as we did), using two Move controllers is compulsory. There’s no option for a DualShock or even aim controller. However, if you don’t already have two of Sony’s electronic lollipops, we’re tempted to say that The American Dream justifies the investment. Your avatar stays sat down for the entire experience, but the implementation of using your hands independently is remarkable. You’ll mostly be engaging in prosaic tasks such as washing cars, flipping burgers, feeding a baby, and fishing… but the hook here is that you’ll be doing absolutely everything with firearms. Handling, shooting, and aiming (including down sights) the guns is smooth and (in a slightly disturbing turn) feels very natural. That said, we occasionally had a little trouble aiming down the sights of the largest guns, presumably down to the size and layout of our darn UK houses. You don’t get much more American than shooting burgers in a diner. Presented as a cross between a ghost train and an infomercial, the people and creatures you’ll come across as you travel the rails are all painted wooden cut-outs. Your guide and narrator is Buddy, a model of a dog with a speaker rammed into his mouth. The script is razor-sharp (with a caveat we’ll get on to shortly), and all the acting superb. Combined with some neat visual gags, it’s consistently funny and sometimes laugh-out-loud hilarious. A perfect balance is struck (for the most part) between being entertaining, and conveying the satirical message without ramming it down your throat. That’s impressive indeed. This is essentially a parade of minigames, and breathe a sigh of relief, because Samurai Punk have remembered to make these minigames enjoyable. 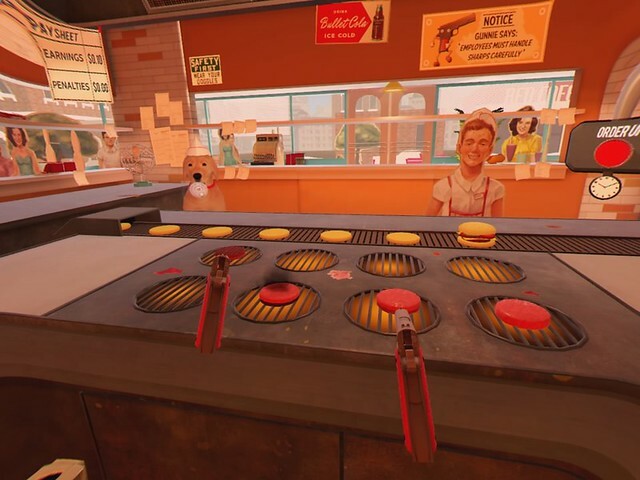 The aforementioned burger flipping game doesn’t demand much in the way of accuracy, but you’ll quickly struggle to keep an eye on all those potentially burning patties. Conversely, the sequence where you give haircuts by shooting the locks off hapless citizens is fast-paced and extremely demanding. It certainly doesn’t hurt that Buddy provides laugh-inducing, Call Of Duty inspired commentary here (“haircut confirmed!”). There are a few unconventional guns, including one to hold a beer (guess how you open it? ), and the “handgun” used to steady your aim with longer barrels such as the shotgun, and to grab larger magazines. Speaking of which, you reload by hitting a button on the relevant side of your chair, and either grabbing the bullets or – satisfyingly – using the gun itself to catch the ejected magazine in mid-air. Indeed, despite being an anti-gun game, it still feels cool to use the things at times, giving a brief taste of how real-life gun nuts must feel about their deathsticks. As pleased as we were with how proficient we became shooting and reloading the bolt-action rifle, in context, it felt slightly disturbing to suddenly realise how much we were enjoying it. 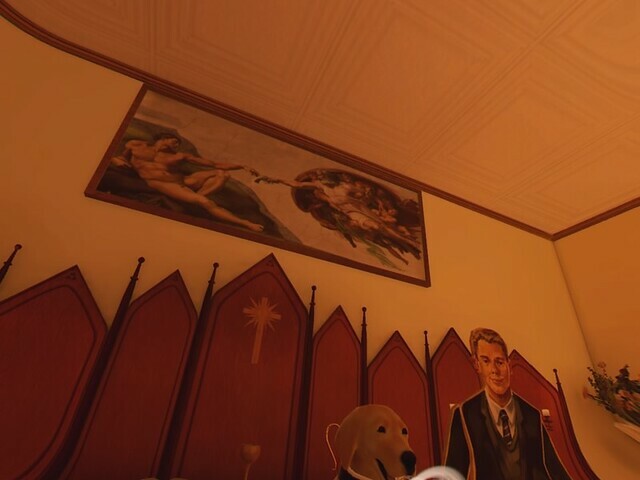 Look very closely at the painting, and you’ll realise why this is one of our favourite ever screenshots. As fun and hilarious as the game is there are, unfortunately, problems that are impossible to ignore. Although the most egregious bug we encountered has now been patched, it’s still likely you’ll come across hitches and glitches now and again. Also, the sound mix is astoundingly terrible. About three quarters of the time, it works perfectly fine; the rest of the time, two characters will talk at the same time, or the music will roar over the dialogue to the point where you need to strain to hear it. Fiddling with the various sound levels in the menu achieves very little. Worst and most baffling of all, the final chapter takes everything that makes the rest of the game such a wonderful experience… and bins it. It begins with a long, rambling, unfunny, unsubtle, unskippable speech that sits completely at odds with the rest of the script. There is then, of all things, a boss fight; a terrible boss fight. It’s so sad to see the game end on a low note like this. Despite the undeniable flaws, there’s a lot to love here, although how affluent you are will determine whether or not it’s worth the price tag currently attached (even after the pricing error has been fixed). The whole thing lasts roughly three hours, but it’s got more replay value than the average VR title. At least some of the 22 chapters are likely to tempt you back for score or achievement/trophy chasing – but an option to skip dialogue you’ve already sat through would be very welcome. With a little more polish and a completely different closing chapter, we could have declared this one of the very best VR games on the market. As it is, it’s still an enjoyable and very memorable experience, and definitive proof that games can – and should – do satire.